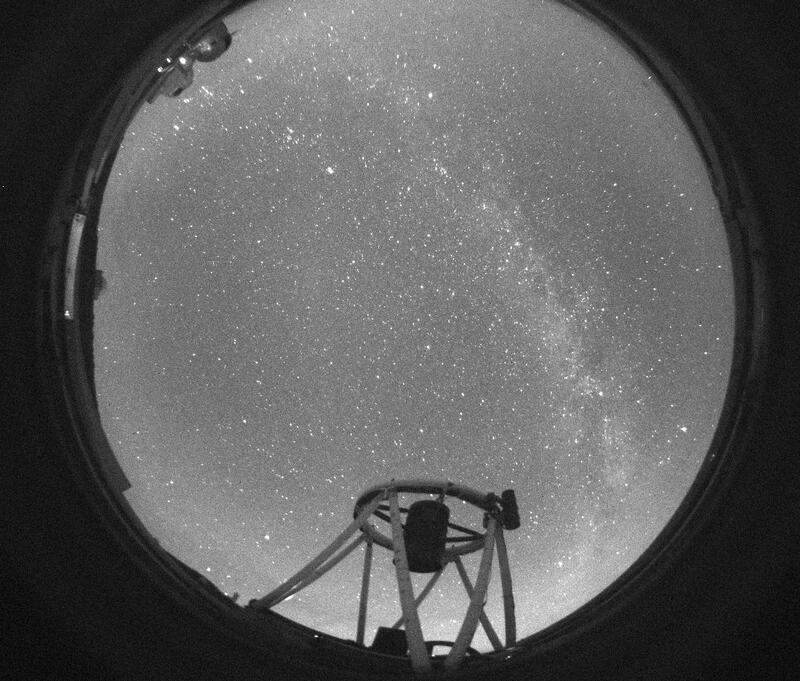 "SkyCam" is a project aimed at providing simultaneous wide-field observations in parallel with normal LT data taking. 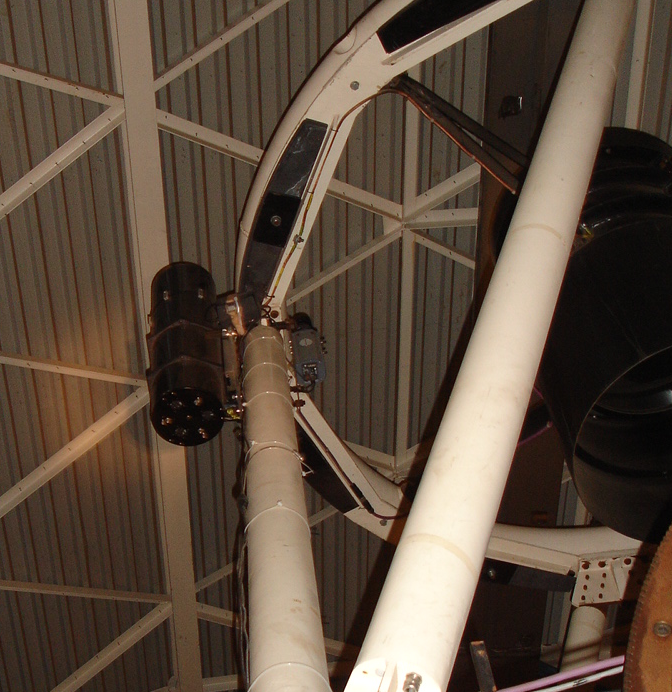 Three cameras offering different fields-of-view are currently being used: SkyCam-A is mounted on the side wall of the enclosure and gives a fish-eye view of almost the entire sky above the telescope, plus SkyCam-T and SkyCam-Z, both of which are mounted on the top ring of the telescope (shown right). SkyCam-T currently offers a 9 degree field-of-view (a different lens was in use prior to 22 October, 2014, which yielded a 21 deg field-of-view). SkyCam-Z is housed within an Orion AG8 telescope to give are finer resolution though smaller 1 deg field of view. 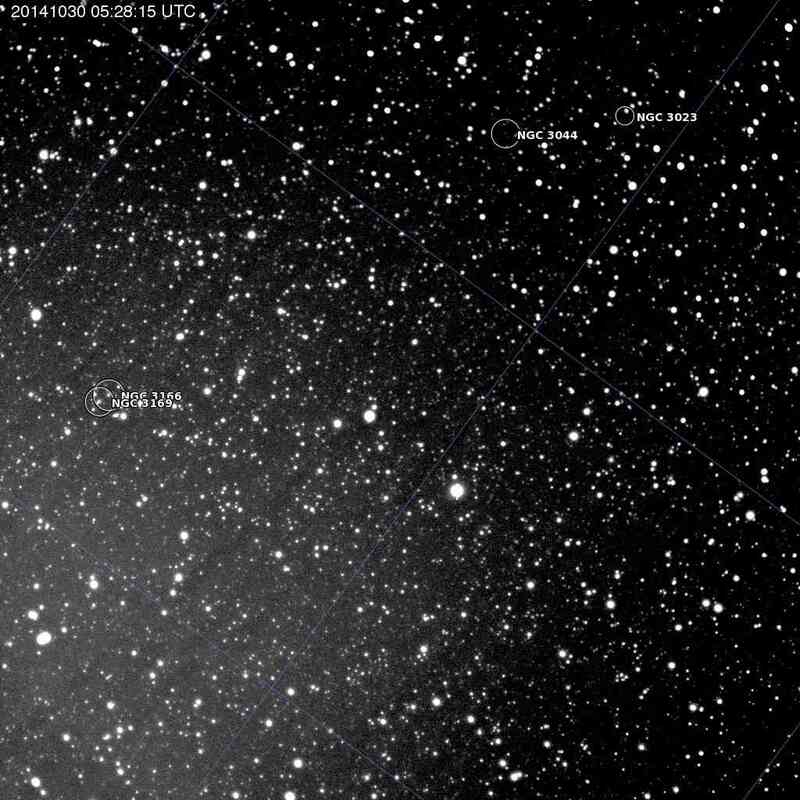 At any given time, SkyCams T and Z therefore image whatever field is being observed by the primary science instruments on the back-end of the telescope. 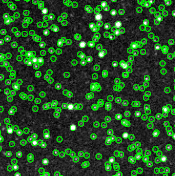 All data taken with SkyCam-A and SkyCam-T are immediately public to all and may be used for any non-commercial scientific or educational purpose. Data taken with SkyCam-Z remain proprietary. Please contact the LT group if you require access to these data. All three cameras are potentially very useful for monitoring observing conditions at the telescope. Indeed, every night instrumental zero-point measurements are obtained from each SkyCam-Z exposure. A plot of these ZP measurements can be used to track changes in transparency. 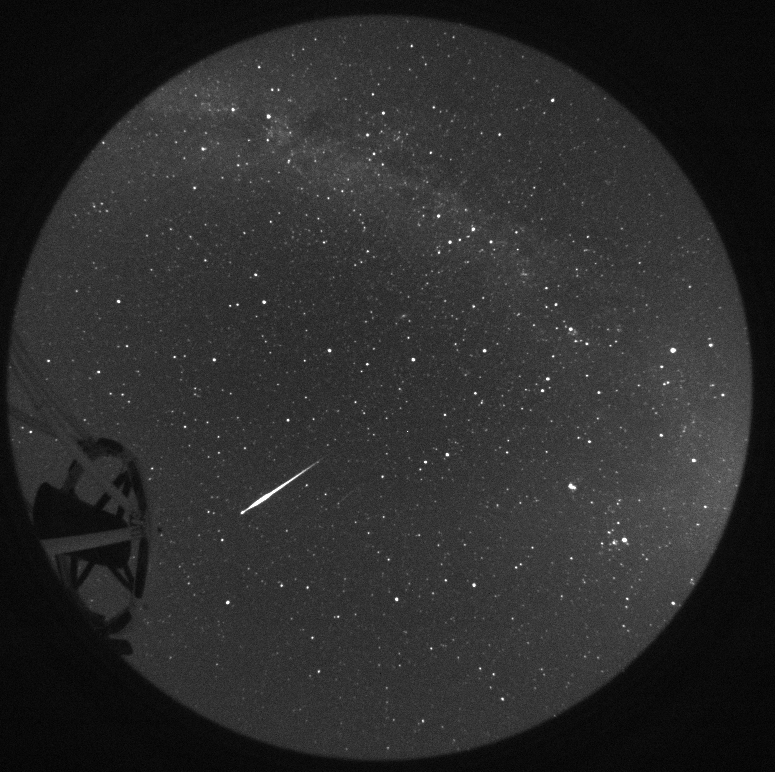 When used alongside Movies created from all images obtained with each camera, LT users should be able to qualitatively establish how clear or cloudy a given night was. These ZP plots and Movies are available from our Night Reports archive. The information given below represents only an overview of the SkyCam system. A more detailed description of SkyCam operations, software processing and photometric reliability may be found in STILT: System Design & Performance, Mawson, Steele and Smith, 2013, AN, in press (ArXiv e-prints, arXiv:1305.0573, http://arxiv.org/abs/1305.0573) which describes one particular photometric project based on SkyCam data. SkyCam-A - an "all sky" camera on a fixed mount inside the LT enclosure. The Andor ikon-M DU934N-BV camera (4.5 mm lens; F/2.8) which was in use for a number of years was replaced in Summer 2014 with a Starlight Xpress Oculus camera. This instrument uses a 1.55 mm F/2.0 180 degree fish-eye lens to provide horizon-to-horizon coverage down to about 6th magnitude. It is capable of detecting reasonably thin cirrus and on dark nights is useful for checking for the presence of clouds affecting data, etc. SkyCam-T - a "medium field" Andor ikon-M DU934N-BV camera mounted on the LT top-end (see photo above) which parallel points with the telescope. This instrument currently uses a Zeiss Planar T 85mm f/1.4 ZF2 lens which yields a pixel scale of 31.6 arcsec and a field-of-view of roughly 9 degree (prior to 22 October 2014 a Nikkor 35mm f/2D focal length lens [set to f/4] was in use which provided a 21° field-of-view and a 73 arcsec pixel scale). The faintest sources detected with the current set-up are about 13-14th magnitude, though in uncrowded fields SkyCam-T is 90% complete down to R~11.7. This camera is arguably the most useful of the three for tracking passing clouds! SkyCam-Z - a "zoomed field" Andor ikon-M DU934N-BV camera mounted inside an Orion Optics AG8 telescope next to SkyCam-T. Like SkyCam-T, SkyCam-Z parallel points with the telescope. 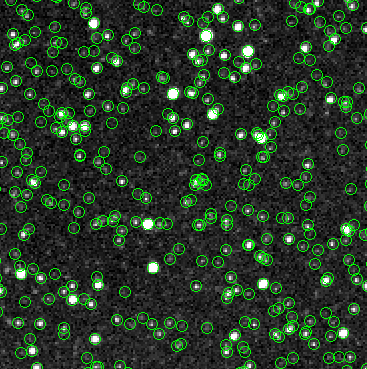 The current set-up provides a 1 degree field-of-view with a plate scale of 3 arcsec/pixel. 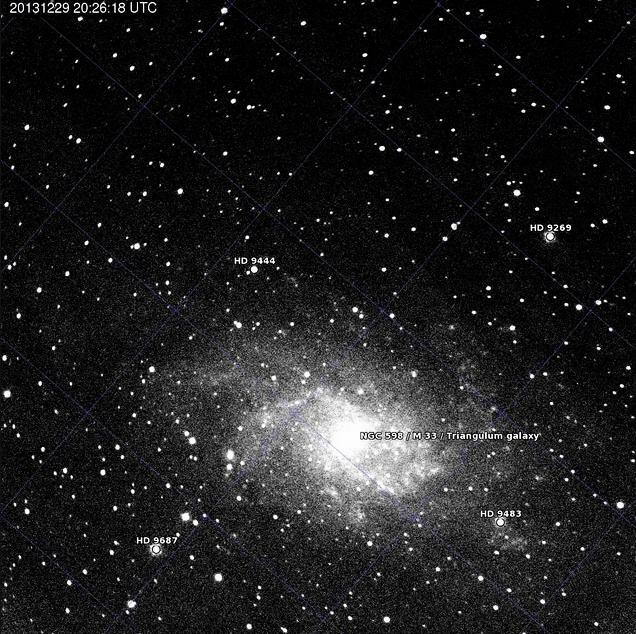 SkyCam-Z can detect sources down to about 18th magnitude and often yields spectacular images of galaxies and nebulae. The Andor ikon-M DU934N-BV cameras used with SkyCam-T and -Z contain 1024x1024 pixel, back illuminated and anti-reflection coated CCDs running at -40°C. 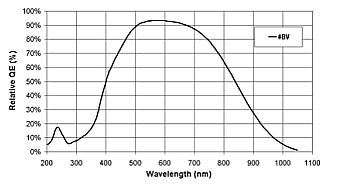 A quantum efficiency curve is presented below. No filters are used with any of the cameras. Gain and readnoise measurements are available upon request.